IfIneed to put some decent home-cooked dinner on the table with minimum fuss, this is my favourite goto one-pot recipe. Elsewhere, I have explained at length how to do a really good pot of this but for a quick dinner, it makes sense to keep it simple. It will still be delicious. You can opt to use boneless chicken meat, which will cook faster. 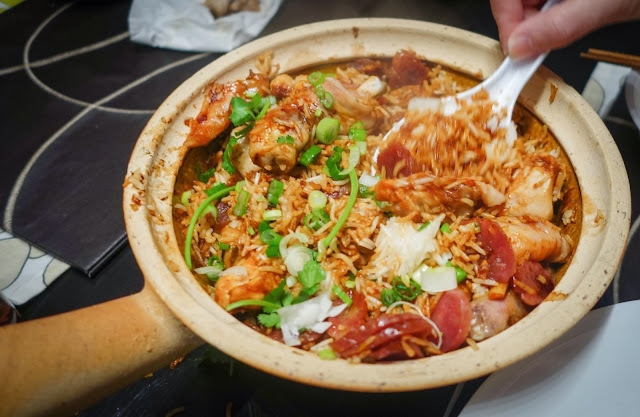 Use the right sand clay pot, cook the rice just right and you can expect a very good dinner, all done within 30 minutes. It is now 6.00 pm and you have to prepare for your family of four. Add two cups of rice into your pot. Add equal amount of water. Break the cube of chicken stock into the water. Put it on the stove with a small flame. While that is cooking, you cut up your chicken into bite-sized pieces. Mix in 1 tablespoon of soy sauce, half a teaspoon of sesame oil, a dash of pepper, a teaspoon of sugar, a teaspoon of dark soy sauce and 2 teaspoons of corn flour (which helps to keep the meat moist and silky). Cut one or two Chinese pork or chicken sausages into thin slices. After about 10 minutes, lift up the pot cover and you can see that the water has now been absorbed into the rice. Add the chicken pieces on to, all on one layer. Pour in any leftover sauce. Than add the slices of sausage on top. Close the pot and cook for another 12 minutes. By now, the chicken will be nicely cooked. Garnish with diced spring onions. Serve it hot on the table. By 6.30 pm your dinner should start. My family have enjoyed every pot of this and I am sure yours will as well.